When it comes to maintaining the water quality in aquariums, activated charcoal remains the best product for filtering the water and keeping the environment clean and healthy. Activated charcoal adsorbs organic wastes that stress the fish and also discolor the water. Because of the tremendous surface area created by the activation process, the adsorptive properties of charcoal can't be beat. 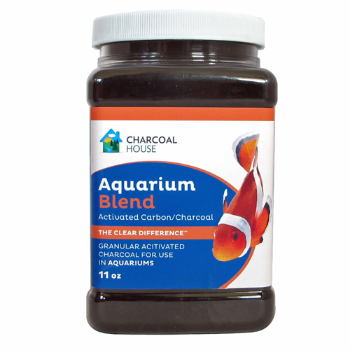 The granular charcoal that we sell has been specifically recommended by one of the largest aquarium manufacturers in the U.S. It is sold in bulk orders of five to 55 pounds. Our customers include those with small household aquariums and outdoor Koi fish ponds as well as those with large commercial fish bait tanks. In order to remain effective, granular activated charcoal used for aquariums should be changed regularly. With regular use, the charcoal's adsorption abilities will decrease as the charcoal particles "load up" with water pollutants. By purchasing a bulk order of activated charcoal, you'll not only save money, but you can be sure that you always have some on hand when it is needed. Proper aquarium maintenance is important if you want to preserve the health of your fish. To protect the delicate balance of life in each tank, monitor the water quality closely and use activated charcoal to continuously filter the water. For more information on activated charcoal and its uses around the home, take some time to browse through the information on our site.